The real solution to maximize the output of your solar panels. This solar tracker smoothly positions your panels throughout the day to accurately capture the maximum exposure of the sun. As we all know, the more power you generate, the more money in your pocket. Out system provides reliable, time base movements throughout the day and returns to its home position at the end of the day. Far more reliable than those systems using photo sensors and thermal expansion, and less expensive! It comes with a pow-erful high torque actuation that will provide you with y ears of trouble free service. 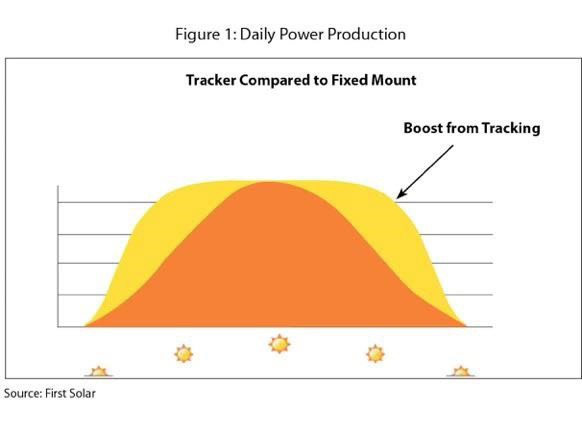 The graph shows how much more effective collecting and storing solar power can be when utilizing the Solar Time Tracker configuration. 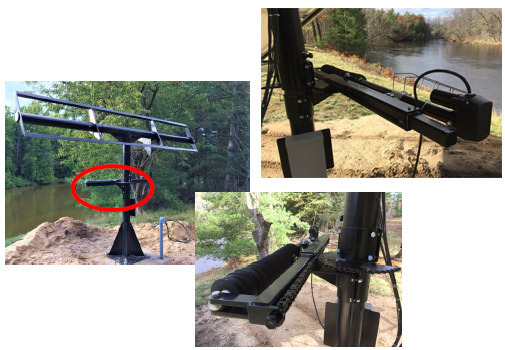 This 6-inch pole is secured to the foun-dation and the support brackets for the solar array have been attached. The heavy-duty actuator is circled in red. 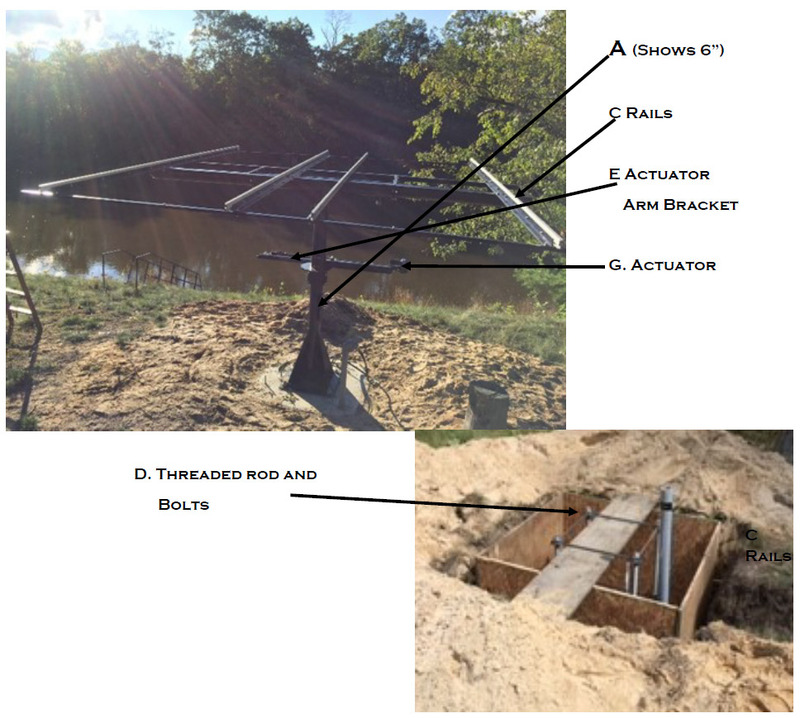 Installing a Solar Time Tracker Pole starts with a solid foundation. 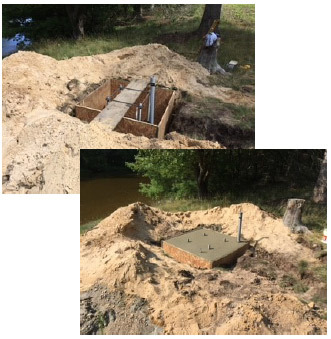 The foundation for this 6-inch heavy duty pole measures 4’ x 4’ x 4’. The 4-inch pole requires a 3’ x 3’ x 3’ foundation. 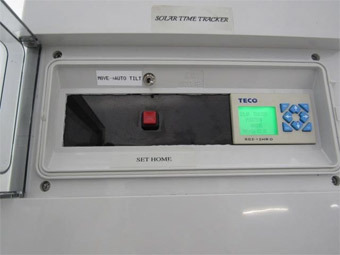 Solar Time Tracker control box is installed in an protected location to control the actuators on the pole. It is easy to set-up and operate with bright LCD display showing position and time. Rugged design provides years of trouble-free service. It’s use will maximize your panel’s output by 35-45%. 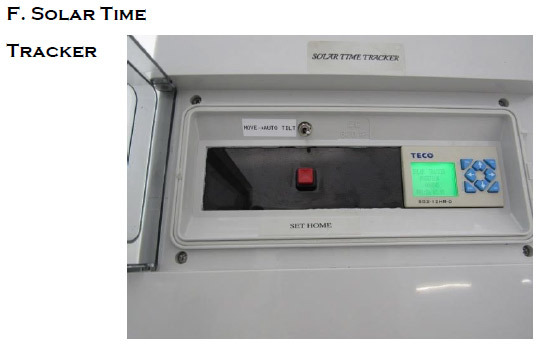 Uses real time clock instead of unreliable sensors. Thank you for looking at our product reviews. This is a new feature we have just started offering and hope that it will help you make a decision about our products. If you already own one of our greenhouses or another one of our products, we would appreciate a few minutes of your time and ask you to answer the following questions. We appreciate your time! Which of our products are you reviewing? What tips can you share for future MI Greenhouse owners? These greenhouses come to you as a 1 piece unit that requires NO assembly, requires NO electricity for the solar operated roof vents, and requires NO maintenance.